To make parts of a pie chart stand out without changing the underlying data, you can pull out an individual slice, pull the whole pie apart, or enlarge or stack whole sections by using a pie or bar of pie chart. Double-click the slice you want to pull out, and then drag that slice away from the center of the chart. The quickest way to pull all of the slices out of a pie chart is to click the pie chart and then drag away from the center of the chart. Right-click the pie chart, then click Format Data Series. 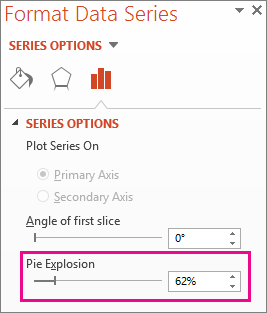 Drag the Pie Explosion slider to increase the separation, or enter a number in the percentage box. Tip: You can also give your pie chart a different perspective by Rotating a chart. Pie-of-pie and bar-of-pie charts make it easier to see small slices of a pie chart. These chart types separate the smaller slices from the main pie chart and display them in a secondary pie—or stacked bar chart. If you don’t indicate how many data points should appear in the secondary pie or stack, the chart will automatically include the three smallest. In this example, that is 3%, 3%, and 4%. Right-click the chart and then click Change Series Chart Type. Click Pie, and then click Pie of Pie or Bar of Pie. 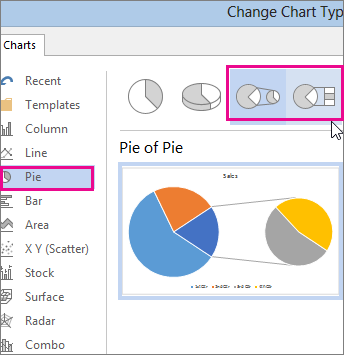 To change what displays in the secondary pie, click the piece of pie you’re expanding, and then in the Split Series By box of the Format Data Series pane—click the type of data to display in the secondary chart. 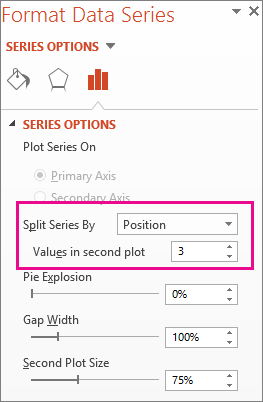 If you’re splitting the series by position: in the Values in second plot box, enter the number of positions you want (such as 3 if you want the 3 smallest). If you’re splitting the series by value or percent value: in the Values less than box, type a different number. In the example above—with 3%, 3%, and 4%—you might enter 5%. The left chart is always the main chart, and the secondary chart is always to its right. You can’t rearrange them. Connector lines will add automatically. You can remove them or change the connector styles. In Excel, the percentages in the data labels may be rounded. If so, they likely won't add up to 100. To fix this, change the number of decimal places specified for percentages on the Number tab of the Format Cells box (Home tab > Number group, > Dialog Box Launcher ).